A once in a lifetime happening - Justin Welby, the Archbishop of Canterbury, led the service and gave the sermon at our Harvest Brunch - after he'd had breakfast with us, of course! Archbishop Justin talked about the ten lepers Jesus healed, when only one of them came back to thank him and praise God. God has done so much for all of us in Jesus, and he wants us not only to thank him but to get to know him and become part of his family. Click here to watch the talk or here for a five-minute overview of Archbishop Justin's weekend in Worcester diocese. This is something you won't see very often - a Bishop in full robes taking a service on Hay Green! With bellringing, too! Having finished his training curacy, instead of moving on to a vicar job, Tom has been appointed to stay on here until the end of June 2019. To mark the occasion, the Bishop of Dudley, Graham Usher, and Archdeacon Nikki Groarke, joined us for a special service of licensing, prayer and celebration. You can read Archdeacon Nikki's talk here. Afterwards, we enjoyed a barbecue together. "Why look for the living among the dead? He's not here. He has risen, like he told you." What does an orange remind you of? The world, of course, which God made. Sweets and dried fruit represent all kinds of God's good gifts. But human beings put ourselves at the centre of our world; we put a finger into the slit in the orange, and ended up in a sticky mess! So the light of Christ came into the world, and we put candles in the slit as intended. Jesus' love is so great that he shed his blood - the red ribbon - for the world. The story of this year - refugees on the move. Journeys. The story of Christmas - people travelling to parents or children or grandparents. Journeys. The story of the first Christmas - angels bringing messages from heaven to earth... people from all over having to go to their birthplace to pay taxes... wise men following a strange star... families scattering to avoid a cruel king who wanted to wipe out a rival. Many journeys. The story behind the story - God the Son leaving heaven to come to earth to be born, live and die, going from there to here to be with us so that we can go from here to there and be with him. The journey of all journeys. "Mary treasured up all these things and pondered them in her heart". Thanks Julie Ackroyd for opening that up to us in dance and monologue! Return of Stambermill's biggest cracker - even bigger (though sadly not better) than last year. A minor technical fault meant it didn't actually crack, but it still sprayed "Christmas presents" over the stage. What do a piano, an iPod, a microphone, two superheroes, several emergency vehicles and a rope have in common? Songs or Rescue! Or in this case, Songs of Rescue, sung to celebrate God sending his Son to rescue human beings. At Harvest Festival, we celebrate the fact that we have food to eat, and thank God for the people who grew, picked, packed, transported and sold it for us. We also thank God for making it grow in the first place! So what better way to celebrate Harvest than by eating? Of course, there were activities and worship as well. We put up tents like the ancient Israelites at their harvest festival. We made collages and pomanders; we watched videos about what God's people are doing to help some of the people who don't have enough to eat; we heard what God has to say about harvest; we sang and we danced. Each year, one of our Bishops visits Lye and Stambermill for a Confirmation service, when people can say publicly that they are now following Jesus. It might be someone who was baptised as a baby, has grown up in the church, and is now ready to commit themself to God. Or it might be someone who has started coming to church as an adult, and has come to a point of wanting to declare their trust and loyalty to Jesus. But for the last 30+ years, Bishop after Bishop has visited Lye church... because in Stambermill there wasn't a church for them to go to. In 2015, though, Bishop John Inge agreed to bring that to an end, and Brickworks Church was privileged to welcome him to preside at a Parish Baptism and Confirmation Service in the hall at Rufford School. 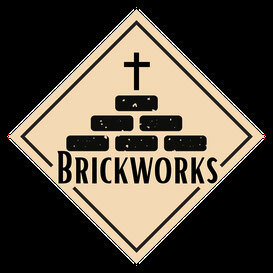 Lye Church cancelled their main morning service, lent us their music group and brought their congregation to join Brickworks Church for the morning. Craig and Emma Smith from Brickworks were confirmed, and Isaac Milne and Joanna Ackroyd from Lye Church were baptised by immersion (in a paddling pool in the playground) then confirmed. Isaac and Jo are dancers, and they had written a dance to tell the story of their growth in faith. Our friends from Church in the Community in Lakeside (near Brierley Hill) joined us for a service on Malvern Avenue Green. Everyone was invited - and the diocese made a video! You can watch it here (the speakers are Nikki Groarke, the Archdeacon of Dudley, who just happened to be at St Thomas's in Stourbridge that morning and came along afterwards, followed by Tom Fish then Andy Hodson, the pastor of Church in the Community). The children played an important part in the service - they built Andy's props for the talk!